In a country where safe drinking water is scarce, JanaJal's water-dispensing ATMs offer a clean, convenient and inexpensive solution. On his weekly road trips between Pune and Mumbai, Parag Agarwal often came across people who not only begged for money but also asked for his bottle of water. The requests made him curious, and soon he realised how the poor suffer from the shortage of drinking water. At that time, Agarwal owned Panama Water Management, a company that worked with the government on water treatment projects. "I did some research and found that India is suffering due to poor management of water resources," he recalls. In July 2013, Parag and his younger brother Anurag, a US-based investment banker, set up the Supremus Group and its flagship initiative JanaJal that would tackle drinking water scarcity by developing and installing water ATMs. Within 18 months, he was ready with his first prototype - a water kiosk featuring an ingenious combo of water purifier and water vending machine, with a cloud-based monitoring system fitted in for remote management. Making sure that clean and affordable drinking water is available 24x7 for the people is no easy task. India has the maximum number of people in rural areas - 63.4 million - living without access to potable water, according to a report (Wild Water, State of the World's Water 2017) by WaterAid, a global advocacy group focused on water and sanitation. The JanaJal machines making a rapid pan-India foray is one of the viable solutions that can take care of the '3C's' - cleanliness, convenience (read widespread distribution) and cost. To buy clean water, users get a bunch of options - from swiping their ATM prepaid cards to paying via digital wallets or Unified Payment Interface (a single-window mobile payment system) to paying with coins. Each unit has up to three taps and can dispense 15,000 litres a day so that it can service a community of 1,500-2,000 people. The water dispensed comes in various quantities - 250 ml, one litre, five litres, 10 litres and 20 litres - which can also be customised as per requirements. 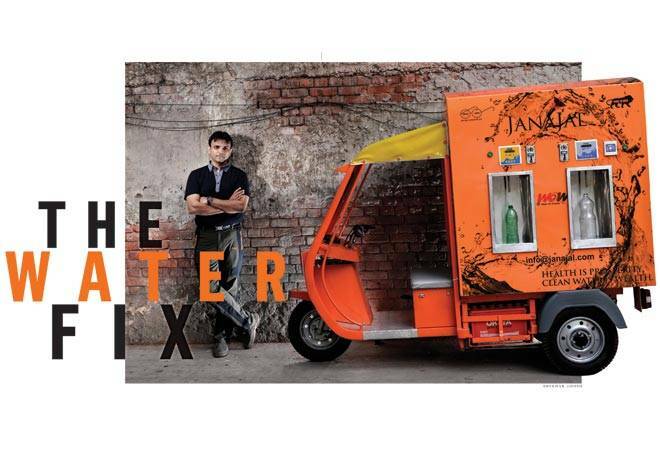 The company has recently launched mobile water kiosks called JanaJal Water-on-Wheels where it has 500-litre tanks mounted on e-rickshaws to provide on-demand water delivery service to households. It is now doing a pilot in Ghaziabad, Uttar Pradesh, with 75 e-rickshaws. JanaJal sources water from municipalities, does a lab test to assess the quality of the water available and then decides on the most suitable purification method. The issue in India, says Parag, is that the water changes after every 100 km or so. Consequently, there can be no uniform solution that uses any single technology. JanaJal has adopted a technology-agnostic approach and uses a number of methods (or a suitable combination), including reverse osmosis (RO), ultraviolet (UV), ultrafiltration (UF) and carbon filter. It typically takes around three-four weeks to instal the first JanaJal water ATM in a specific area, but subsequent installations take less time. Each ATM can be monitored and remotely controlled through GPRS-based software lodged within the unit. Although the units are mostly managed online, a trained operator is also present at the site. "We want to create jobs for the community where the ATM is located," says Parag. In a bid to create a social entrepreneurship model, JanaJal shares up to 40 per cent of the gross revenue with these operators. The company currently charges Rs 5 per litre, which could come down depending on the location and the company's business and financing model around that particular water ATM. When non-profit organisations sponsor water ATMs, the capital investment is borne by the sponsor and the water is sold at a subsidised rate. For instance, the cost of water has reduced drastically at Khora village in Ghaziabad where The Hans Foundation helped instal five water ATMs. Here one can buy a litre of drinking water for as little as 30 paise while 20 litres cost just Rs 6. The cost of installing an ATM is around Rs 8 lakh and it takes two-three years to recover the unit cost, says Anurag, responsible for fundraising and global investor outreach. "We do keep a 20 per cent profit margin at the EBITDA level and after taxes, have a 10 per cent margin. The strategy is to focus on volumes and thus create a sustainable business," he adds. Over the past four years, the brothers have invested over Rs 7 crore in the company, and they claim JanaJal has earned Rs 1.7 crore in revenues in the financial year 2016/17. JanaJal's safe water network is growing fast. So far, the company has installed more than 285 water ATMs in Maharashtra, Gujarat, Andhra Pradesh, Telangana, Rajasthan, Uttar Pradesh and parts of the Northeast region. Last year, Supremus got a contract from the Indian Railway Catering and Tourism Corporation (IRCTC) for 39 installations across the major stations in Mumbai. It is a public-private partnership project in which the company will build, own and operate the facilities. The charges are nominal too, Rs 5 per litre, which is the IRCTC's approved tariff. JanaJal is also eyeing corporate clients and has installed three water kiosks at Essar's Hazira plant in Gujarat. It is further planning to foray into rural and semi-urban markets. Scaling up such ambitions has its challenges as the business of drinking water is no longer niche. There is competition from its ilk - from companies such as Sarvajal and Amrutdhara Water Services. Then there are big names in the fray, including Tata Power, Voltas Water Solutions and Eureka Forbes. One challenge that consumer product businesses face is ensuring that the quality of the product and the user experience are uniform across all the places where it is present. What works for these companies (if they want to focus on volumes) is a franchise model that ensures all the water kiosks under the companys umbrella, the hygiene, and the operators communication skills are standardised, says Jagannarayan Padmanabhan, Director at CRISIL Infrastructure Advisory. Interestingly, such a model has worked well in water-starved countries like Kenya, and even Indian firms like Sarvajal follow it. The Agarwals, however, prefer to operate the entire value chain, saying that is what sets them apart. There is a further fillip to growth as in February this year, US-based social impact fund Tricolor Cleantech Capital committed to invest up to $5 million over the next two-three years. The company will use the funds to expand pan-India. "As per our target, each JanaJal ATM should be able to dispense one million litres per year. We will also get to 1,000 installed systems by the end of 2017," says Anurag.